We are excited to welcome landscape designer Nadja Quiroz to GreenWorks! Nadja is a recent graduate of University of Oregon’s Master of Landscape Architecture program with an interdisciplinary background focused on ecology and environmental issues. Her work is driven by a curiosity for what influences our relationship to the environment, and a desire to repair that relationship. Nadja comes to GreenWorks with an excitement for public projects—specifically green infrastructural projects, learning and/or play environments, and parks—because of their wide impact on the community. She loves the synergy of collaboration and is skilled at facilitating public involvement, drawing on years of experience working as a peer counselor and youth mentor. GreenWorks Welcomes (Back) Jason King! We are excited to announce the return of Jason King to Greenworks as a Associate Principal. Jason is a Landscape Architect with over 20 years of experience, focusing on ecological design, green stormwater infrastructure (GSI), and vegetated roofs with numerous built works. His work spans multiple sectors including urban development, healthcare design, campus, multi-family and mixed-use housing, streets and infrastructure, master planning, and community-centered design. He pushes the boundaries on sustainable strategies, through implementation and development of sustainable sites with LEED and SITES, as well as his involvement as a contributor and assessment team member for Salmon Safe. We are excited to announce that Margot Halpin has joined GreenWorks as a Landscape Designer! Margot comes to Greenworks with an educational background in Natural Resource Planning coupled with a Masters in Ecological Landscape Design and Planning. She is drawn to projects that result in community building and educational spaces as well as an ecologically rich habitat for native plants, insects, and animals. Welcome Margot! We are pleased to announce that Andrew Holder has joined Greenworks as a Landscape Designer. Andrew brings over 17 years of design experience to the firm. 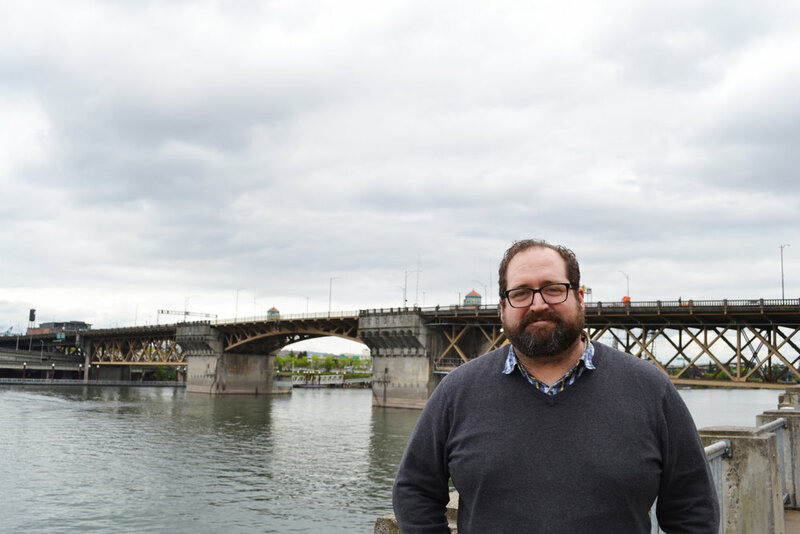 He has worked on a diverse range of projects throughout the Portland region including parks, recreation planning, multi-family residential development, public schools, and higher education. Andrew brings a practical design approach, creative solutions, and an emphasis on realizing the client's vision to every project he works on. Welcome Andrew! We are pleased to announce the return of Sean Stroup to GreenWorks! Sean comes to GreenWorks with a skill set enhanced by his time as a construction foreman where his hands-on experience translated to an understanding of constructability and strong technical deftness. His experience includes project management, natural resource planning, sustainable stormwater management, green infrastructure design, recreational/interpretation design and environmental restoration. Welcome back, Sean! Flora, a senior project manager at GreenWorks, took the opportunity this week to present to us the importance drawing has on the design process. An article written by renowned architect, Michael Graves, inspired the presentation. He argues that computer-aided design software, such as AutoCAD and SketchUp, has replaced hand-drawing along multiple phases of the design process. His ultimate message is that drawing should never divorce itself from design, because it stimulates the imagination and expresses the interaction of mind, body, and hand more so than technology is able to. Flora shares these beliefs with Graves, and often utilizes hand-drawing over computer-aided design software in her designs. This process is directly reflected in her work for Mt. Hood Community College where, after site analysis and setting goals with the clients, Flora began with study sketches of the space. Through refinement, she transformed the sketches into design layouts. The concept plans and axonometric sketches were presented to the students and faculty at an open house at the school earlier this week. Thank you for sharing your design process with us Flora! We are excited to announce that Judith Edwards has joined the GreenWorks team as a Marketing Coordinator. Her experience ranges from website development to content creation. In college, she studied Cultural Anthropology and focused on ecological anthropology—how cultures adapt around an environment. Now, as an avid gardener, outdoorswoman, and environmentalist, she is passionate about bringing humans into a closer relationship with the earth for our mutual benefit. She is looking forward to putting her experience in writing and marketing to work telling the GreenWorks story—how we’re bringing people and nature together through creative and sustainable design. Welcome Judith! We are excited to announce that Bhronwhyn Dean has joined the GreenWorks team as a Landscape Designer. Her project experience covers a wide range of scales and types from custom residential design to campuses, trails, and natural areas. She enjoys working at a fine-grained scale to bring a project from the drawing board to reality, whether that is permitting, construction documentation or construction administration. Her particular passion is for trees and plants of all types, so her favorite projects are those that provide adequate space for trees in all their glory. Welcome Bhronwhyn! Wishing all of our clients, partners, and friends a wonderful holiday season and a happy New Year!